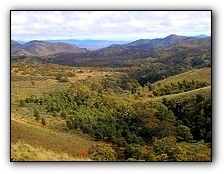 Worumba Station is considered a relatively small pastoral lease of 70 square miles(48,000acres). 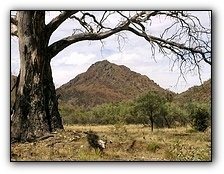 But its location in the higgledy piggledy collection of hills of the “Worumba Anticline makes it a very interesting destination.It has an abundance of pine and mallee tree forest as well as river redgum lined creeks. 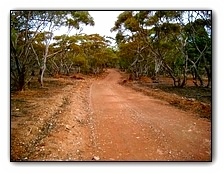 7 km east of Hawker on the old Cradock dirt road is the sign posted turn off to the Willow Waters Gorge and Worumba Homestead( which is another 22 km). As you travel east you will soon see the Worumba hills which will draw you into their intimacy. …. and the weir in Willow Waters gorge which was built by early prospectors/miners well over 100 years ago. Over the years it has silted over and is now part of the road which leads to the homestead. The water is now used as a stock and wild life watering point. At the large white gate you enter into Worumba Station. Just inside the fence is a section of restored 1920 dog and rabbit fence. Take care on the trip in to the homestead as the road is narrow and winding. 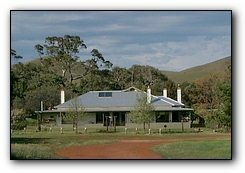 200 meters from the house on the Willow Creek is modernised, nicely appointed shearing quarters/accommodation- made with the privacy of single groups in mind. To the East you can see the woolshed and cattle yards. 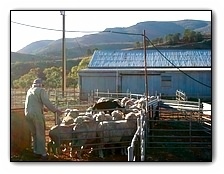 Care must always be taken at Worumba in take it is working sheep and cattle station.